Madrid – Spain and Greece on Monday pledged to jointly renew efforts to fight illegal immigration into the European Union. Spain will intensify such measures when it takes over the EU presidency in the first half of 2010, Prime Minister Jose Luis Rodriguez Zapatero said at a joint press conference with his Greek counterpart Costas Karamanlis in Madrid. 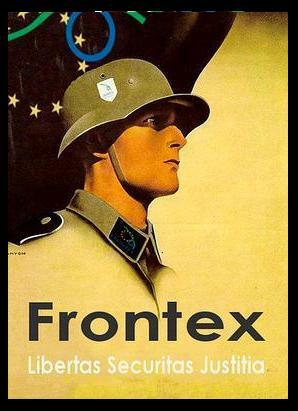 Spain will focus on strengthening the European frontier control agency Frontex and on seeking repatriation agreements with undocumented immigrants’ countries of origin, Zapatero said. The agreements should also include cooperation programmes to promote the social and economic development of the countries in question, in order to discourage their citizens from seeking better lives abroad, Zapatero said. Karamanlis proposed a European coast guard to improve maritime surveillance. Spain and Greece were among the European countries most concerned by the influx of immigrants across the Mediterranean, Zapatero said. The antagonism between states is the game under which the share of the fear or the risk of social unrest due to harsh economic and social conditions becomes itself something to be negotiated between players. Migration “flows” are a parameter of this risk – certainly not the only one, and not the severest one , since non migrant populations have also many reasons to resist. 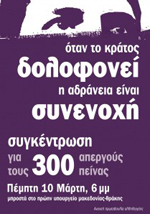 Notwithstanding the inter-state antagonism, though, the best strategy for all states to have their powers unchallenged is to scapegoat someone for the domestic problems, and the best way to do that in the case of Greece is to blur preemptively any social reaction – by immigrants and non-immigrants – in the national threat / political “destabilisation” discourse. Barrot, thus, mingles the traditional external enemy (Turkey) with the novel internal one (immigrants) for the Greek government and offers a service of disorientation. BRUSSELS (AFP)–A huge flow of migrants through Turkey could threaten social unrest in Greece, European Union Justice Commissioner Jacques Barrot said Thursday. “There is a major threat to the equilibrium of the Greek democracy because of the uncontrollable flow of immigration,” Barrot told a press conference in Brussels. Greece has accused Turkey of failing to stop clandestine immigration through Turkish territory which the Greeks say has pushed their resources to the limit. Greek Interior Minister Prokopis Pavlopoulos Tuesday said the number of migrants detained in Greece tripled to 148,000 in 2008 from 40,000 in 2006. Europe’s asylum legislation puts pressure on the first E.U. country that receives applicants to handle their claims, but the rules could change in the next six months. 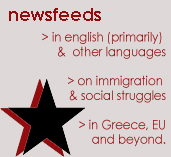 Immigration is causing social tension in Greece and is used as an argument by the extreme right, which saw its share of the vote rise to 7% in recent European parliamentary elections. Barrot visited Greece this week and called on Turkey to do more to tackle clandestine immigration. “Turkey has to help us fight the facilitators and the traffickers who push people to make risky journeys,” he said in Brussels. “We can’t simply remain motionless. We have to get much firmer control from the Turkish government. We would also encourage the Turks to sign a readmission agreement,” the French commissioner said. He added that he would like to see readmission agreements with Pakistan and other Asian nations, from where some would-be migrants begin their journeys. Barrot said he intended to relaunch debate on immigration during an informal meeting of E.U. interior and justice ministers in Stockholm July 15-16. E.U. nations Cyprus, Greece, Italy and Malta are in the frontline of the battle against migrants without papers and are gearing up for the summer wave of arrivals by sea. Other E.U. nations refuse to be constrained to accept numbers of asylum seekers to help the four, with some stressing that they have to concentrate on the E.U.’s eastern borders in the former Soviet Union. Governments in Europe are putting lives at risk by denying refugees protection, Amnesty International warned on Saturday. “Refugees are risking their lives to find safety only to be turned away when they reach Europe,” said Nicola Duckworth, Europe and Central Asia Director at Amnesty International. Amnesty International’s call for government action comes on World Refugee Day, which is held on 20 June every year. World Refugee Day sees thousands of organizations in hundreds of countries coming together to focus global attention on the plight of refugees and the causes of their exile. Italy is intercepting refugees in international waters and physically transporting them, without assessing their protection needs, to Libya, where migrants, asylum-seekers and refugees are at risk of ill-treatment and forcible return to countries where they risk serious human rights abuses. Greece pushes back people at its land border and sea borders with Turkey without first assessing their asylum claims. For those that do enter the country there are many legal obstacles for refugees to gain protection. Spain’s bilateral agreements with several countries in Africa are used to justify the arbitrary arrest, detention and deportation of asylum-seekers and migrants in these countries. Turkey continues not to recognise people from outside Europe as refugees, meaning thousands of people are denied the protection they need. On World Refugee Day, Amnesty International warned EU states that their actions are undermining the protection of refugees not only in their own countries but also across the world, by sending a dangerous message on the treatment of refugees. The organization said that all countries must meet their obligations towards refugees and asylum-seekers not only within their own borders but wherever they exercise effective control.